Coffee culture is more than the brew inside your mug. It’s not about whether you take two sugars or three. Or whether you like cold brew best or a mouth-watering macchiato. It’s a focus on what’s warm and welcoming—of connection with others over your favorite beverage. Coffee has become a big part of the culture of Lancaster. Check out the map and guide below, then make your way around the City and taste each unique brew! Click it, save it, print it, follow it. 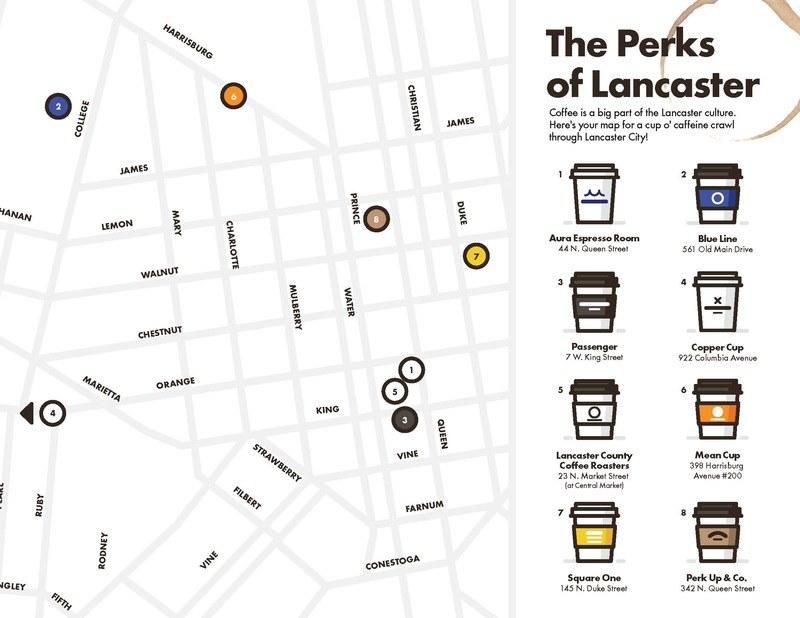 It’s your cup o’ caffeine coffee crawl through Lancaster City! Lancaster County Coffee Roasters is prevalent throughout the whole community—adding their rich brew to a variety of menus in the area, and also serving delicious favorites at their stand at Lancaster Central Market. But the new addition may just be our favorite—the draft latte. It’s a new innovation that’s basically a light, creamy coffee milkshake. With standard favorites and a delicious cold brew, you have to check them out. Also, you can find their coffee at a variety of cafes and restaurants downtown (including Annie Bailey’s and Commonwealth on Queen), and utilized as an ingredient for delicious dishes like the Coffee Cured Petite Filet at Checkers Bistro. In your coffee crawl, don’t miss Mean Cup. You can check out their location in Champion Forge, or visit Lancaster Central Market. Choose from a variety of beverages including chai latte, drip coffee, London Fog, espresso, hot chocolate, and much more. Mean Cup is known for seasonal beverages, too. As the Autumn season progresses, make sure to explore what is surely some delicious Fall favorites. Square One is an award-winning micro roaster in Lancaster. They source their coffee ethically, paying well above even fair trade costs to help forge strong, sustainable, and meaningful partnerships with their farmers. Check out the shop for coffee from Brazil, Costa Rica, Mexico, Ethiopia, and many more. Plus, there is an assortment of coffee blends, teas, espresso, and other delicious beverages. They also have two shops in Philadelphia—further expanding their reach and goal to serve incredible coffee. One of the downtown staples, and a premiere destination for coffee-lovers, Passenger Coffee was named the Best Coffee In Pennsylvania by Food & Wine. Need any more reasons to stop by? Their shop, right next to Lancaster Central Market, serves nationally renowned coffee while showcasing a culture that is focused on collaboration, relationships, and sustainability in their sourcing. Did we mention the coffee is absolutely amazing? LEFT: Blue Line. RIGHT: Aura Espresso Room. Blue Line Coffee serves Passenger Coffee at a fast-casual cafe on the campus of Franklin & Marshall College. It’s open daily, so college students—don’t miss your chance at experiencing premiere brew at this shop in historic downtown Lancaster. The team at Aura Espresso Room wanted to recreate the feeling that customers were walking into a small European cafe. Because of this, they have a partnership with the renowned Lavazza, from Italy. That company has specialized in the production of gourmet coffee for generations. The team at Aura are proud to bring it to Lancaster City and add it to the growing coffee scene here! At Copper Cup, it’s about incredible coffee—but with added emphasis on customer service. The team looks to create custom-roasted flavor profiles in the coffee while also offering a customized experience for every customer. From lattes and cappuccino to matcha and milkshakes, there are beverages for everyone. Photo from Perk Up & Co. The Perk Up & Co. team looks to serve delicious coffee (and other treats) while being committed to the community and environment. With biodegradable containers and a mission to minimize their carbon footprint, Perk Up is hoping to spark change one coffee cup at a time. The shop moved to The Candy Factory, so be sure to check it out in the new space!